Raising farm animals and growing vegetables have been human activities since antiquity. Recently, farming techniques have also been applied to certain fish species, an activity known as aquaculture. 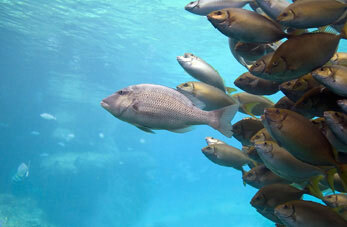 The main reason has been overfishing, which has caused the reduction of fish caught by traditional fishing methods. The research carried out on these new techniques as well as on new breeding methods has allowed more and more species to be raised in captivity: salmon, trout, Mediterranean sea bass, sea bream and turbot are among the best known. Fish farming has evident advantages for consumers and the potential for future growth. On one hand it allows these products to be put on the market in a regulated way, so that it is possible to meet increases in demand. This is because it is possible to plan production and because it is not dependent on the weather, which limits the days a boat is able to fish. On the other hand it provides fish of uniform quality and size, adapted to consumers’ different needs. But the main advantage of aquaculture is that it supplies fish species that used to be considered luxury products at a reasonable price. Fish farming, however, entails certain risks, especially if it is not subject to strict controls. The most evident hazard is the presence of residual chemicals in fish due to overuse or to inadequate use of products such as antibiotics or disinfectants. On the other hand, it allows control measures to prevent illnesses and parasites, unlike what happens in species fished the traditional way. Another problem posed by this activity is the possibility of producing negative environmental impacts, although this is also possible with traditional fishing methods. One of these negative impacts is the management of waste products generated by fish farms. Environmental impact studies are necessary to avoid these problems. They should include the appropriate corrective measures to solve them and design and management planning to minimize unfavourable effects. If you finally decide to buy farmed fish, how will you recognize it? All you need to do is read the labels, which are compulsory and which will show if fish have been caught in the wild or have been raised on a fish farm.